What is the recipe for success? What is the secret? How can you make sure your project is one of the next European Enterprise Promotion Award (EEPA) winners? EEPA is an opportunity for public bodies and public-private partnerships from across the EU Member States, (as well as Iceland, Serbia and Turkey) to put forward their most imaginative and successful initiatives that support entrepreneurship and small and medium-sized enterprises (SMEs). Each country selects their top national winners to compete at European level across five different categories. Why should you enter EEPA? Not only does it allow for reflection but it provides an opportunity to meet with other pioneering initiatives from across Europe, as “participating in a competition is a real opportunity to meet and share with initiatives and people…learning from their experiences is very enriching”. Some winners also mentioned the increased internal learning and contact saying that “entering EEPA gives a unique opportunity to exchange experiences and contacts with colleagues, experts and other stakeholders, drawing focus to the relevant questions and impact SME development”. 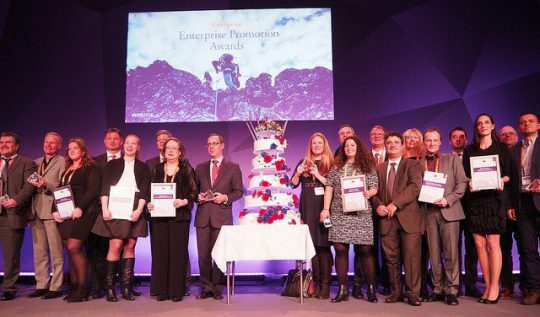 All the winners agreed that winning, in the words of one winner “the most rigorous and professionally run enterprise award in the world”, was quite an experience. Ultimately this award “provides recognition from a higher recognised entity like the European Commission”, which for many has led to exciting national and international developments for their projects. What should you bear in mind when you apply? Interested in finding out more about EEPA? Are you going to apply and compete for a European title? Be sure to contact your national coordinator for more information and check when your national deadline is. Hurry up because the deadlines are approaching! Read about the SME Assembly 2017 during which the EEPA finals and awards ceremony will be held.